We have already seen and been amazed by Google’s driverless car, but a group of Australian students from Griffith University in Queensland, Australia have put an interesting spin on the concept. The group of students consist of Tommi Sullivan, Michael Lennon, and Yukito Tsunoda and they were recently awarded a Queensland iAward for their creation. The prototype of their driveless car is only the size of a toy vehicle but the way it operates is quite intriguing. 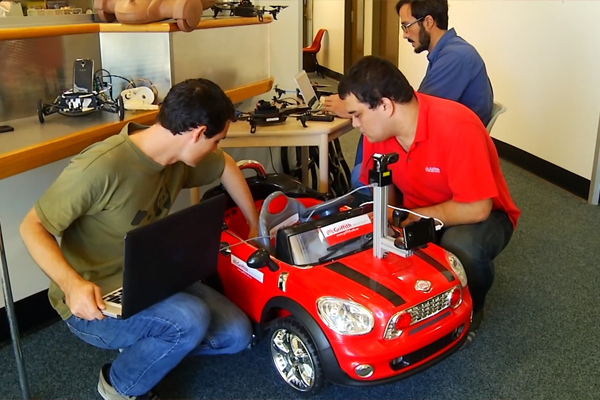 The car uses a smartphone mounted on its hood which transmits crucial information needed to autonomously operate the vehicle. According to Michelle Starr of CNET, the camera is used to pick out lane lines and the phone’s GPS is used for navigation. This is quite different from other iterations of autonomous vehicles which use separate components such as independent cameras and other sensors in order for the car to operate. These components are of course a great deal more expensive than a single smart phone. This technology could make the driverless car much more affordable than it is currently shaping up to be due to the need for specialized components.